The general Minamoto no Yoshitsune has a falling out with his elder brother Yoritomo, and is forced to flee to safety in the north of Japan in disguise as a mountain priest. However, en route at the barrier gate at Ataka he is recognized by the barrier commander Togashi no Saemon. His faithful retainer Benkei distracts the guards by reading out a fake subscription scroll and then by beating his master over the head. Respecting the strength of devotion and desperation that pushed Benkei to commit such an unthinkable crime, Togashi allows the party to pass through. The Subscription List is a kabuki version of the noh play Ataka, performed on an over-sized parody of the noh stage (matsubame). 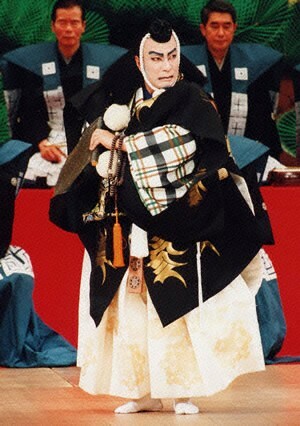 : Hattori Yukio, Ichikawa Danjuro Daidai. Tokyo: Kodansha, 2002. Copyright (C) 2009 Naritaya All Rights Reserved.